NB. Before reading any further it should be noted that Arundo donax has become a monumental problem in certain ecosystems of California and Mexico and no doubt other warm wet places. If you are planning to grow this plant please check that it is wise to do so first. 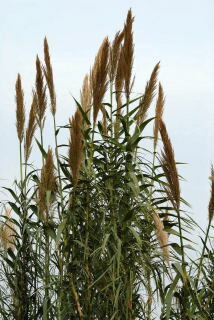 Arundo donax, also known as the giant reed or Spanish reed can develop intense insecurities over the growing season. Constantly referred to as 'corn' or 'bamboo', the plant has problems coming to terms with its true identity. Despite this, the giant reed will produce canes up to 4 meters in height over one season. This allows the giant reed to be used as a foliage curtain. 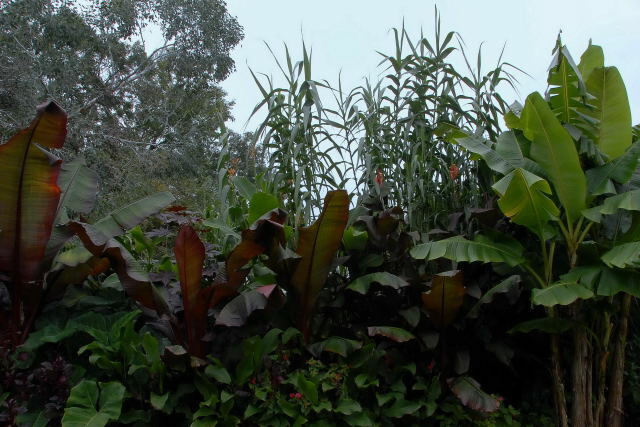 Most plants look more appealing when there is some form of natural back drop, this plant provides a perfect foil. Like any grass, Arundo donax will gradually spread. The plant shown in the above picture was purchased as a small specimen, (probably in a 5 litre pot). It was planted six years before this picture was taken. If spreading concerns you, the plant can easily be contained with a root barrier as with the case of bamboo. This plant is generally purchased as a growing plant. It must be possible to grow from seed but seeds are rarely, if ever, offered for sale. Once in the ground this plant will require little maintenance. The plant is considered hardy in zone 7. 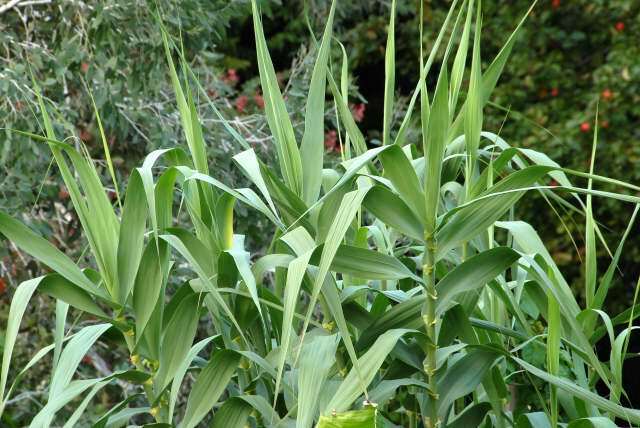 Plenty of organic matter dug into the soil will get your Arundo donax off to a good start. As usual with any new plant, water well until established. Once established this plant should not require any supplemental watering. The only thing you really need to do to this plant, once it is established, is to cut down the stems annually. This is mainly for reasons of aesthetics. During the winter the canes turn brown. In the spring, these canes will produce lots of new branches and leaves. At this time, the canes begin to shed their brown outer layers. The trouble is, not all the brown bits fall off. Some remains on the plant all season, leaving it looking scruffy. Not only do the brown bits look scruffy but the new side branches produce many small leaves. This also contributes to the overall scruffiness of the plant. The solution to this is to cut all the canes back the ground. This produces lots of fresh luxuriant growth. 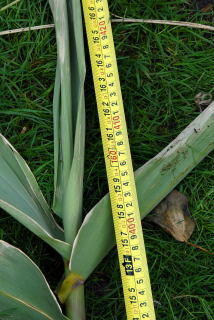 The leaves produced after cutting back are much wider and longer. Given this treatment, Arundo donax is almost unrecognisable from the yellow-brown stands of it, seen when on Mediterranean holidays. Any time after it turns brown. The precise moment is up to you. If the plant still serves a purpose such as blocking a more considerable eyesore, leave the canes until February. If they look too messy, cut them down along with everything in the general post-frost clear up. As the stems of Arundo donax begin to reach final height they can become knocked about a bit by the elements, the wind in particular. A combination of wind and relative position of the sun may cause the plant to lean forwards. This causes a knock on effect to any plants growing in front of it . You end up with a situation not unlike a rock concert. All the plants pushing forwards towards the lawn, like teenagers towards a stage. To prevent this occurring, the stems of the plant can be secured to a wall or any fixed object using wire or string. In the case of this garden, the garden wall is covered in ivy. The canes are pulled to a vertical position and secured to the thick ivy stems at about 4½ feet (130-140cms) up the stems. One thing to remember if you have used wire to secure the stems upright - Make sure you remove all traces of it before shredding the stems! The simplest way (not necessarily easy) to propagate this plant is by division. As you plant grows, the clump will begin to get a little bald in the centre. At this stage you may wish to dig the plant up. You are then able remove the unproductive centre, divide up what's left and re-position it. The time of year to attempt this, as with most grasses, is just as growth commences. 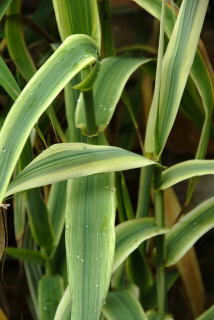 Some people have success propagating Arundo donax using the side branches that are produced on more mature canes. The branches are cut into short lengths and the leaves removed. The stem cuttings are then either placed in water filled trays until roots appear, or in seed trays covered with damp soil. These methods are not fool-proof and anecdotal evidence suggests a high failure rate. Stem cuttings method revealed here. If propagation by stem cuttings was more reliable, this plant would probably be a more attractive proposition. Having said all that, it is well worth having a go with this plant at least once. Flowers are unlikely in northern climes as the growing season is just too short. However, in its native southern Europe, it can be seen flowering around October time. If you have had enough of this plant, its removal is outlined here.